So, Kimmie Rhodes. Singer-songwriter, former Willie Nelson collaborator and duet partner and generally overlooked talent from way back when, she has been quietly taking care of business by writing, recording and performing since 1981 without ever achieving the recognition she deserves. Well, maybe now is the time to put that right. On “Cowgirl Boudoir”, Kimmie works with multi-instrumentalist Johnny Goudie, producer Gabriel Rhodes and Sunbird Studios house band to create a poignant, forthright and sometimes achingly beautiful set of songs that deserve a wider audience. And it’s not just a collection of songs, the album has a narrative which flows from the hauntingly world-weary opening duet, “I Am Falling” with Johnny Goudie to the positive and uplifting closer, “Yes”. With “Cowgirl Boudoir”, you get a lot of bang for your buck. There are fourteen songs on the album and absolutely no filler; every song is there on merit. It’s fair to say that there aren’t too many cheerful little toe-tappers but the songs are well-constructed, beautifully played and sung from the heart. There’s a theme which runs through the album; about half of the songs are about dysfunctional and flawed relationships, but that’s not really news in the singer-songwriter genre or in country music generally, is it? Musically, the core of the studio band is Kimmie Rhodes (vocals, guitar), Johnny Goudie (vocals, guitar, piano), Gabriel Rhodes (just about everything), Dony Winn (drums, percussion) and Glen Fukunaga (bass) with the seasoning supplied by Jolie Goodnight (backing vocals), Tommy Spurlock (steel guitar, Dobro) and Stephano Intelisano (keyboards). The musical settings emphasise the mood of each song on the album, from the plaintive steel guitar of the opening track and “Lover Killing Time” to the uplifting piano on “Me Again” and folksy feel created by mandolin and guitar on “Always Never Leave”. Not forgetting the psychedelic feel of the electric sitar on “The Sky Fell Down” and the Hammond B3 filling out the mid-range of “Worthy Cause”. The lyrics are deceptively simple; they sound very straightforward, but they’re actually very well-crafted. “Me Again” uses themes and characters from fairy stories and fables to evoke childhood, and buying “Eight Days a Week” to represent a rite of passage into adulthood and music, while “Trouble Is” has the listener trying to work out what trouble actually is before working out that trouble just is. And I could go on, but the best bet is for you to have a listen for yourself. 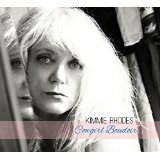 “Cowgirl Boudoir” is out now on Sunbird Records (SBD 0021) and you can see Kimmie Rhodes on tour here. I’ve been listening to ‘Cowgirl Boudoir’ all week and it’s the best album I’ve heard in 2015.I love the voice,love the melodies & chorus lines,love the instrumentation.Best of all I love the songwriting. Kimmie has a knack of always choosing the perfect adjective ,not always the expected one.Like ‘nefarious’ describing the narrators plans for getting even.Or ‘mighty’ for the morning sky .I just love this album.It’s perfect.